I’ve decided I’m going to talk, here and there, about some character profiles I have noticed in books/movies. And I thought I would start with the character who is allowed to know everything. Now, I must make a clear distinction here…this is not the “know-it-all”, although sometimes I think these two character-types can overlap. But while know-it-alls think they know everything (and often annoy the muffins out of everyone else because of it), the character who is allowed to know everything actually does know everything, or nearly everything (and that’s okay). Why is this character important? Well, I think, particularly in sci-fi and fantasy genres, there are often things that need explanation, and quick. Sometimes, the MC and gang cannot figure things out themselves (they simply don’t have the materials or the memories to know the truth), or else it would take hours (pages, many minutes…) to show them actually researching the information. Which would be boring. But the information needs to be shared somehow, so…the character who is allowed to know the information steps in. This character can be represented in different ways. In Harry Potter, the role is shared between Hermione and Dumbledore. Hermione is the “book smart” variety, the girl who has conceivably read every book on the face of the planet and can thus explain whatever happens to need explaining at the time. Dumbledore, on the other hand, plays the “wisdom” role, knowing everything because he has lived a long time, and has learned a lot of valuable information and skills during the many years of his life. This knowledge can also be present in a character’s very existence. 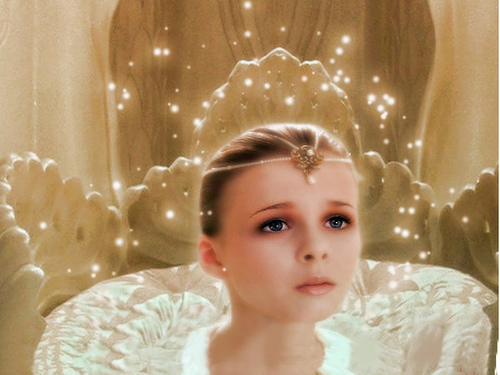 In The Neverending Story, the Childlike Empress knows everything. Why? Because she’s the Childlike Empress, and that’s, pretty much, her job. Sometimes, this character does not know everything but knows everything about something. In the book I recently reviewed, The Midnight Palace, the character Siraj (I believe) knows everything about ghosts and superstitious tales. He does not know every fact in the world, but he knows pretty much everything about that one particular subject. And sometimes the character isn’t designed to know everything, but somehow creates that persona him or herself. This fits more easily into film. In my experience, there are two actors — Vincent Price and Jeff Goldblum — who can turn any character into a genius. For some reason, whenever these characters say anything, I can totally believe it. Below is a clip from the amazing Price film The Tingler. If you watch the first part of this clip, you will see Vincent explaining what the tingler, a bug that develops when you are afraid and goes away when you scream, is. The actual idea of the tingler is ridiculous…but listen to Price explain it, and see if it doesn’t seem plausible! 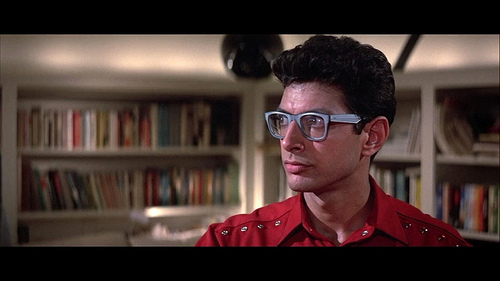 The image below is of Jeff Goldblum’s character New Jersey in Buckaroo Banzai. I tried really hard to find this clip, and couldn’t. But in one scene, the gang finds a whole bunch of people listed on a computer, all with the name “John”. And instantly, New Jersey shoots into an account of the days of the month, ending with October has 31 days, so the 31st of October is Halloween, and…don’t you get it! In 1938 Orson Welles had a broadcast about aliens….and that is totally what these names mean! And you totally buy that that is how his mind would work. When writing, I think it’s important to reflect upon your work, and try to identify the roles of each of your characters. Sometimes, characters don’t fit into any one character-type, but sometimes they do. And that’s not necessarily a bad thing. Where would we be without the characters who are insanely useful because they happen to know everything? But it is important to understand your character in comparison to what’s going on around them. If you have a character like this in your writing, think about their back story, and their surroundings. Do they spend a lot of time reading? Have they had a lot of life experience? Do they have some special ability to retain information? Are they obsessed with a certain subject? Having a character who knows everything can be a great way to move plot along and provide explanation without boring your audience into shutting the book. But make sure the character is not just spewing information without any reason behind it. Because that can easily make your potentially lovable character into a know-it-all! So, what do you think. Do you like this character-type? Can you think of any other examples of this? (I know there are tons…I just can’t think of them at the moment!) What is your favourite/least favourite overall character-type? Do you think stories benefit from having these, or suffer?